Thirty-six agricultural businesses and organizations have come together to create the Missouri Farmers Care organization with interest in protecting agricultural opportunities in Missouri. 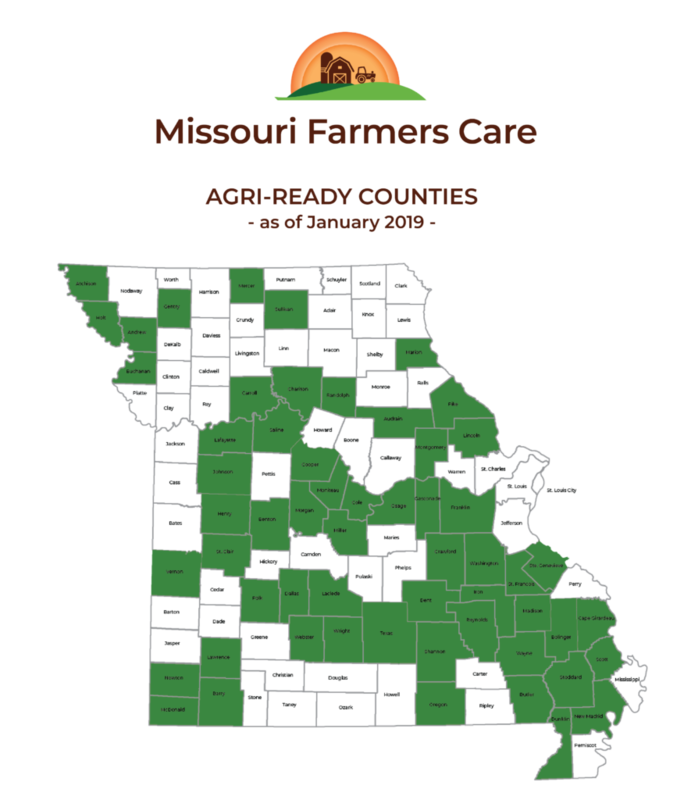 Their partnership has yielded the Agri-Ready County designation program which is designed to promote counties that support Missouri farmers and Missouri’s economic interests in agriculture. What is the Agri-Ready County designation program? Why should a county apply for the Agri-Ready County Designation? How does a county become Agri-Ready? Is the Agri-Ready County designation program statutorily mandated? The Agri-Ready program is a voluntary program, which recognizes counties actively supporting the health and vitality of agriculture in their county. The Agri-Ready designation protects the 284,000 Missouri jobs created by agriculture. The program also supports the 97 percent of family farmers who provide fresh, quality food and feedstuffs in our community. Every county has something to gain from pursuing the Agri-Ready designation. Securing agriculture as a vital part of a county’s economy is a sound business decision. Andrew, Atchison, Audrain, Barry, Benton, Buchanan, Bollinger, Butler, Cape Girardeau, Carroll, Chariton, Cole, Cooper, Crawford, Dallas, Dent, Dunklin, Franklin, Gasconade, Gentry, Henry, Holt, Iron, Johnson, Laclede, Lafayette, Lawrence, Lincoln, Madison, Marion, McDonald, Mercer, Miller, Moniteau, Montgomery, Morgan, New Madrid, Newton, Oregon, Osage, Pike, Polk, Randolph, Reynolds, Saline, Scott, St. Clair, St. Francois, Ste. Genevieve, Shannon, Stoddard, Sullivan, Texas, Vernon, Washington, Wayne, Webster, Wright.